Crochet! magazine debuted in March 2002 with this easy cowl-neck tunic. Annie’s lead designer, Lena Skvagerson gave her modern twist to the tunic-length pullover with her Forever Cowl Tank. Easy comfort, easy stitching. The Forever Cowl Tank, is made of Berroco Elba yarn and sized up to 3X! What else was new in March of 2002?… This adorable pullover. What do you think? Do you have one of these designs in your closet from the debut issue of Crochet!? TELL YOUR STORY! Editor Ellen Gormley wants to hear how crochet has enhanced your life! Submit your story in 150 words or less to Editor@crochetmagazine.com. You may include 1 photo. By submitting a story, you agree to let us publish it. Offering a story is not a guarantee that it will be used. Jackie Daugherty interviewed me about my new online classes for the Crochet World blog, check out the interview here! The Winter issue of Crochet! is out! And while I’m the editor, the cover decision is made by committee. I was thrilled that we chose my Floral inspired motif wrap, Flower Fringe Shawlette, for the cover. 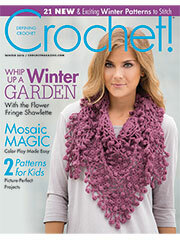 I have never had a design on the cover of Crochet! magazine before, not in all the years as a designer or the 3 years as editor, so I’m really happy! I hope you like it! I’m going to be doing a live Facebook video tutorial/post about the shawlette on Nov 7 at 12:30 EST (I’m pretty sure that’s right) and it will be on the Crochet! magazine Facebook page. Right now we are working on the Spring 2017 issue and it’s SPECTACULAR. Let me give you two hints…. 1. It’s the 15th Anniversary issue and 2. Jenny King. Crochet! Holiday Gift Guide Sweepstakes Tuesday, September 20th! BQueen, Cornerstone Products, Denise Interchangable, Fairmount Fibers, LickinFlames, Mango Moon, Premier Yarns, Skacel, Tahki Stacy Charles Inc and MORE! HERE is the link to enter the sweepstakes! You must click on the link and enter to be eligible to win prizes. Here are just a few of the many prizes being offered! The winter issue of Crochet! is here and I’m so excited! You can get the digital version RIGHT NOW! It will be on newsstands and in the mailboxes of subscribers very soon. I’ll share a few photos here and then later I’ll go into more detail about them but first a few highlights…. European readers can now use this handy chart to convert crochet abbreviations to the more familiar UK terminology! Find it and tons of other useful information on the Annie’s Stitch Guide! In honor of this new information, here is a photo of a cute seagull in the Dingle Peninsula in Ireland! Do you know why Seagulls are from the sea? Because if they were from the bay, they would be Bagels! It’s time for another fresh season of crochet designs. The collections are an all-digital magazine of sorts. You can choose to purchase one or all or any combination of patterns both knit and crochet! Let the parade of crochet design begin! Don’t you just love the earthy colors and Southwest inspired designs? Many of the designs have adorable little video clips that show details of the projects from the photoshoot. Here’s the link to the crochet Autumn Bliss Collection. Did you miss the Summer Love collection? Here’s the link to the crochet collection.